Archives.com contains more than 2.5 billion records of interest to genealogists and family historians. 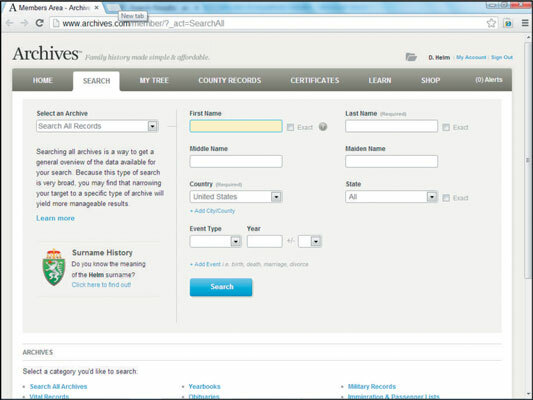 The site is now owned by Ancestry.com, and there are a lot of duplicate record sets between the two sites — especially in the area of census records. One area to look at on Archives.com is the collection of vital records. The site is a subscription site, but you can get a free trial for seven days. Set your web browser to the Archives.com site. The Archives.com home page appears in your browser window. Click the Start 7-Day Free Trial button in the upper-right corner of the page. The billing information screen appears. Fill out the form with your payment information and click the Begin Free Trial button. The Last Step page appears. You can cancel your membership any time before the 7-day free trial ends, and Archives.com won’t bill you. Complete the Create Your Password fields and the optional ancestor-alert information and click the Create Account button. The Archives.com Welcome page opens. Click the Historical Records Search link in the right column.